Alan Munde. 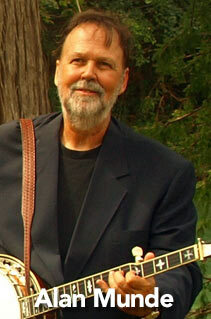 A native of Norman, Oklahoma, Alan Munde is one of the most highly respected and best-loved banjo players in the world. A master of both melodic and traditional Scruggs styles of playing, Alan has played professionally for over 25 years. His touring and recording stint with Jimmy Martin in the late ’60s, his many recordings– solo and with the group Country Gazette– and his wide influence as an extraordinary banjo player and musician, place him prominently in the lineage that began with Earl Scruggs and Bill Monroe. He has performed extensively throughout the United States, Canada, and abroad, and with other major bluegrass musicians such as Byron Berline, Sam Bush, Roland White, Tony Trischka, and Joe Carr. Of his more than 20 recordings, two– Alan Munde’s Banjo Sandwich and A Traitor in Our Midst– were best-selling bluegrass albums for years. Long admired for his creative mastery of adapting fiddle tunes to the banjo, Alan’s vast repertoire ranges from standard bluegrass and Texas swing to gospel, jazz and original compositions. Stylistically, Alan’s playing is lyrical in nature. His artful back-up is unsurpassed, enlivening songs with a delightful, endless mix of rolls, runs, licks and chops played with precision, clarity and beautiful tone. Consummately tasteful, Alan’s playing exudes a vitality, sweetness and subtle humor that makes songs sparkle. Alan was the anchor and major force of Country Gazette from its beginnings in 1972.